Phase 2 — NOAA's Ocean Noise Strategy outlines our vision over the next 10 years for addressing noise impacts on marine life. Phase 1 — NOAA's CetSound consists of two mapping tools which aim to better understand noise impacts on cetaceans. NOAA is committed to improving our understanding and management of human-induced noise and ocean life. Sound is a fundamental component of habitat that many ocean animals and ecosystems have evolved to rely on over millions of years. It is the most efficient means of communication over distance underwater. In just the last 100 years, human activity has increased along more coasts, further offshore, and in deep ocean environments. Noise from this activity travels long distances underwater, leading to increases and changes in ocean noise levels. Rising noise levels can negatively impact ocean animals and ecosystems in complex ways. Higher noise levels can reduce the ability of animals to communicate with potential mates, other group members, their offspring, or feeding partners. Noise can reduce an ocean animal's ability to hear environmental cues that are vital for survival, including those key to avoiding predators, finding food, and navigation among preferred habitats. Phase 1 — CetSound develops two mapping tools, CetMap and SoundMap, which aim to improve our ability to visualize cetacean density and distribution, and man-made underwater noise, respectively. 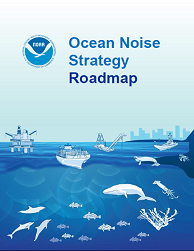 Phase 2 — The Ocean Noise Strategy, following CetSound,identified NOAA's long-term ocean noise management goals, as well as science and policy mechanisms for NOAA to meet those goals. This phase continues through the development and implementation of plans to achieve Strategy goals by programs across the agency. Just how loud is it out there?